The E-Genius range of eMTBs from SCOTT provide huge performance. Some would say unrivaled. Their exciting line up for 2018 is no exception. The ‘Genius’ frame is extremely well established and known as one of the best designs for conventional MTBs. Favoured by many, the natural progression from SCOTT was to use the same technology for their E-Genius, powered eMTB. SCOTT has much to offer this coming season. Their general offering of electric bikes is second to one. It goes without saying that they have a wide range of exceptional touring bikes as well as eMTBs. The jewel in the eMTB crown is undoubtedly their range of E-Genius full suspension bikes. There’s a wide range of models, some being powered by Bosch, others by Shimano’s E8000 motor. All use SCOTT’s innovative and unique ‘Twinloc’ system. This allows the rider to simultaneously lockout both front and rear suspension via a simple control on the bars. Unique and extremely useful especially when the going gets tough! The 730 model remains Bosch powered as in previous seasons. It’s a truly gritty, all round performer thanks to the Performance CX. With 140mm of travel and RockShox Recon’s on the front, it’s a great e-bike with a competitive price that certainly does the job. 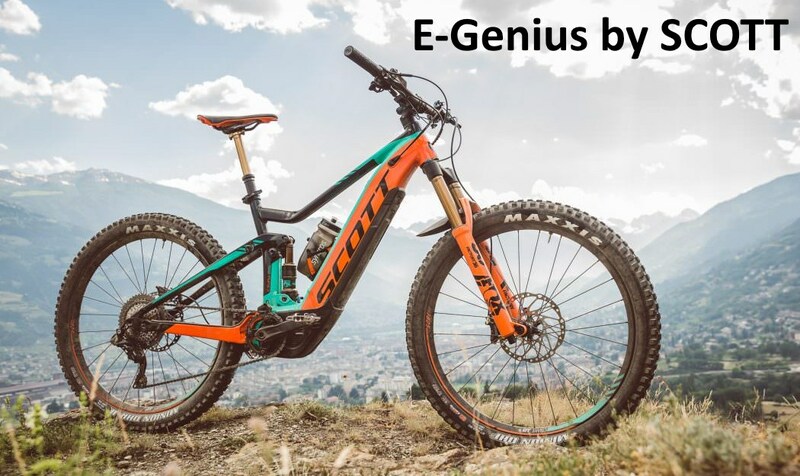 Being the only E-Genius powered by Bosch, SCOTT continue producing this eMTB due to its huge popularity in previous seasons. There’s a number of E8000 powered SCOTT’s in their stable for this year. The two models worthy of note are the 710 and of course, the 700 Tuned. Yes, they’re a step up in price, but the quality of components goes from great to simply awesome. If a high performing eMTB is on the bucket list, then SCOTT have a great selection to choose from!